RCAI Hand Orthoses provide a wide variety of wrist, hand and finger positioning options ranging from sports injury, repetitive stress injuries, and post op conditions, to joint and soft tissue contracture management. 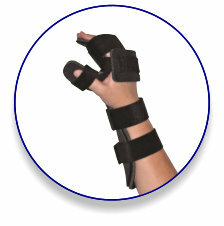 Many are constructed of durable, heat moldable thermoplastic for patient customization and positioning. Washable liners assure patient comfort and compliance.